Wimbledon is the oldest tennis tournament in the world and is widely regarded as the most prestigious among all the major Grand Slams (viz. French Open, Australian Open & U.S. Open). But this year the tournament would be different, notably with the use of AI (Artificial Intelligence) for different applications which would change the way fans perceive and enjoy the game of tennis. Wimbledon, one of the early grand slams to include AI back in 2015, then with help of IBM had developed an intelligent software with a "chatbot" that "talked" to people by answering questions on Wimbledon history & facts and gave fans tailored information on live scores, updated news, and favourite players. Video Highlights: AI-powered automated video highlights for Wimbledon fans. Trained as a self-learning system, Watson™ (IBM AI) has been taught to recognize player emotions faster by increasing the quality of the final output but increasing speed in turnaround time by 15 minutes simultaneously reducing Human editing errors. With an average of three matches per court, per day, entire video from the matches can quickly add up to hundreds of hours of raw footage which could take few hours to pull together into highlight packages. IBM Watson™ auto-curates highlights based on analysis of intensity in crowd noise, players’ movements across the court and match data to help simplify the highlight video production processes and focus on key moments that emerge from the match. 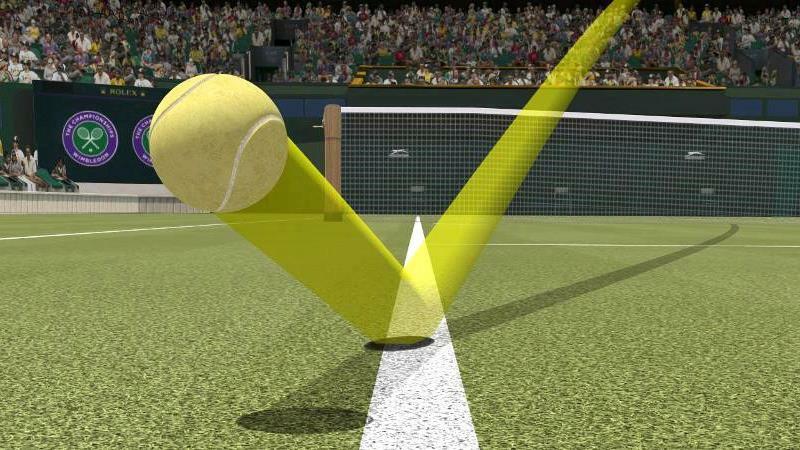 This allows the Wimbledon editorial team to scale and accelerate the video production process for highlight packages. In addition, being able to access the content at a clips level will allow the Wimbledon editorial team to maximize their output within their allowed rights footage. Wimbledon Messenger: A Social assistant for connecting off-site fans, utilizing the Watson™ Assistant chatbot capability and delivered within Facebook Messenger. 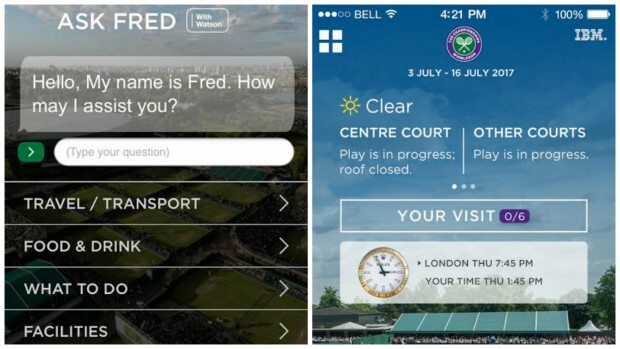 The Wimbledon Messenger experience complements ‘Fred,’ Wimbledon’s in-app AI assistant, to provide a personalized on-site visitor experience and further enhanced for 2018. Enhanced-Interactive Website: the Entire website has been rebuilt to provide content that refreshes dynamically, making the browsing experience more seamless and fast, but also with greater scope to personalize for different audiences. The redesign also allows persistent video viewing to help maximize video use and highlight "The Wimbledon Channel", Wimbledon's live video offering. Designed with an eye for the future not just for 2018, It will allow Wimbledon to deliver ever more engaging experiences with fans in future years. With the launch of Wimbledon Broadcast Services, Wimbledon wanted to ensure that digital platforms are equally able to make the most of the rich array of video content being captured and produced. Combined with ever-increasing rates of publishing demand and digital trends moving towards native app-type web platforms, a new approach was much-needed shot-in-the-arm to Wimbledon.com. Interactive Digital Dashboard: A new editorial dashboard has been created for the AELTC (All England Lawn Tennis and Croquet Club) digital team that will populate in near real-time every shot of a match and its excitement level. The AELTC digital team will be able to view and find the most exciting shot of the day or the match and leverage this content across all their digital channels, including social content tailormade the fans. News/Player Tracking: Whether it’s high-level overviews, point-by-point commentary or more detailed analysis, fans will be encouraged to engage in the in-match experience using different types of media from match highlights to real-time scores to social interactions. Wimbledon fans will have an unprecedented level of analysis, insight, and engagement as the match unfolds, particularly with mobile devices in mind. Real-time data will be integrated from multiple sources including courtside statisticians, chair umpires, radar guns, ball position, player location and even Twitter for social sentiment. IBM’s SlamTracker™ analyzes the players’ definitive playing pattern and styles pre-match from existing player footages in different tournaments to understand which tactics to look for in a head-to-head match. This reveals the hidden patterns & tendencies of the player and match dynamics, pre-determining the pressure situations and allowing fans to follow their favorite player's progress against their key rivals in real time — point by point. Insights include such as pace-of-play, serve placement spread or baseline proximity. 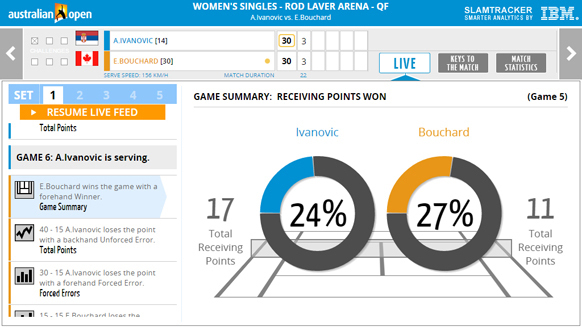 The solution also uses Watson™ APIs to refine and update the player style based on match data. Another feature is "Momentum" which will be a visual depiction of a match with an indication of which player has the momentum to win the game and how that may have shifted over the course of the match. AI has helped Wimbledon to create content that is exclusive, which sets them apart and tells their story in a streamlined manner. For example, in 2017, over 14m net new video views of Wimbledon AI generated video highlights were watched. IBM has worked with the AELTC to deliver everything from design capability (via IBM iX) to building and integrating their latest systems and applications. They have also ensured the continuous availability and scalability of Wimbledon's digital properties by securing the "Aura of the Wimbledon" to the core. For example, during the 2017 Wimbledon, IBM detected and blocked over 200 million suspicious security events. Over 200 IBM Employees dedicated their skills and expertise to help Wimbledon in their pursuit of greatness; delivering award-winning solutions built on years of global sports, media and industry expertise. 2018 Wimbledon will be the most engaging place to experience and open the eyes of every sports fan to the beauty and craft of the players "in their pursuit of greatness." Kevin Simon (ORCID: 0000-0002-2962-8008) is a Marketing Professional at Cognitio Innovo, with a keen interest in technology-driven businesses. He is graduate in management studies (MBA) from the Institute of Management, Nirma University, Ahmedabad.